Less-than-ideal weather was not enough to stop people from taking a stand for gender equality this weekend. 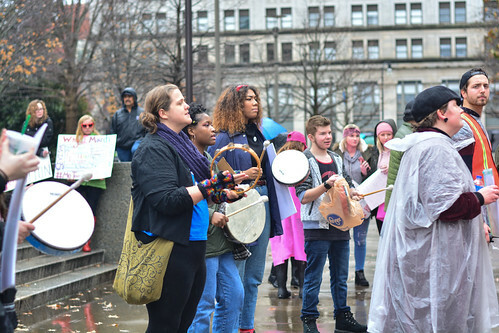 Hundreds of people flocked to Nashville’s Public Square with umbrellas and rain boots for the third annual Women’s March Saturday. Other Belmont students echoed the same sentiment. The march was also accompanied by a small group of counter-protesters – but when the Vision asked to interview them, event security advised against it. Though a part of the national Women’s March movement, Nashville’s event was a stationary rally due to road closures associated with Gov. Bill Lee’s inauguration. The rally featured live music, plenty of speakers and even a yoga flow. Notable attendees included Nashville Mayor David Briley, Black Lives Matter representatives and the band Delta Rae. Putting an event like this together is no easy task, as secretary and treasurer of Tennessee’s Women’s March Cassandra Lanello would know. Pulling the final product together would not have been possible without the unified efforts of volunteers. For volunteer Joyce Neal, involvement in the march feels crucial for our future as a nation. This article written by Katie Knipper with contributing reporting from Marissa Avnaim and Abigail Bowen. Video by Abigail Bowen and Marissa Avnaim. Photos by Liz Gresser and Katie Knipper.